Fiberglass garage doors are an option that a lot of people don't really think about when they go shopping for doors. Most people automatically think steel or wood, but fiberglass is an attractive alternative in some cases. Fiberglass is a relative newcomer to the market, and it offers some advantages that other materials can't match. Fiberglass is made from either glass fibers that are mixed with a resin, or a cloth that is woven from glass fibers and then soaked in resin. The resin is actually a form of plastic. The resin holds everything together and gives shape to the material, and the glass fibers actually give the material its strength. 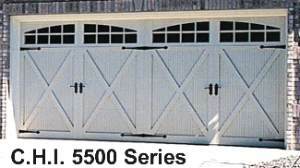 Fiberglass garage doors can be found in the same styles as other garage doors. They can be made to look like real wood in a carriage style door, or they can look like a more contemporary steel model. They are actually sort of a hybrid, because the fiberglass panels are attached to an aluminum or steel framework for support. Some models that are classified as fiberglass are really just steel doors with a fiberglass outer skin. Single layer models only have one layer of fiberglass panels, without any insulation. They are fine for unheated spaces. Two layer models have fiberglass panels on the exterior, with a layer of insulation on the inside. These are much more energy efficient than a single layer model, but the insulation on the inside is somewhat vulnerable to damage. Three layer doors are the best option. They have an added inner layer of steel, vinyl, or aluminum that protects the insulation and gives the unit more rigidity. A fiberglass garage door has several advantages over a unit made from other materials. It is relatively maintenance free like steel or aluminum, but is more resistant to dents than a metal door. It also will not rust like steel will, and the salty air in coastal areas will not affect it. Fiberglass doors are very light, with a weight that is similar to aluminum. This puts less strain on the door opener, as well as on the rollers and other hardware, and makes them easy to open manually. If your door is opened and closed frequently every day, fiberglass may be worth a look. Fiberglass is also translucent, which means that it will allow daylight to pass through it and give some light in the garage during the day. This feature only applies to the single layer type, though, and if you end up painting it later the paint will block out the light. Fiberglass doors can be made to look like real wood, and the more expensive ones are quite realistic, making it difficult to tell that they are not real wood. They will not rot or warp like wood will, and they don't shrink or expand with changes in the weather. Like any other material, fiberglass garage doors have some drawbacks too. They can become brittle with age, and in extremely cold weather the material will be less pliable and can break from a sharp impact. Lower quality examples can also fade over time, too. The single layer type tends to be a little on the flimsy side, and they are not as secure as a single layer metal or wood door. They also are not as popular overall as other types, so your choices are somewhat limited. Several of the largest garage door manufacturers do not offer any fiberglass options. 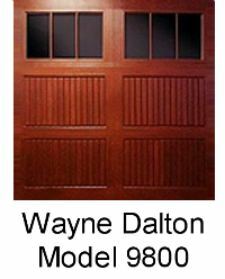 Wayne Dalton, CHI, Overhead Door, Alto, and Arm-R-Lite are a few of the manufacturers that do offer fiberglass models. If you live in an area without extreme low temperatures or if your door is subject to impacts from wayward soccer balls, fiberglass garage doors are certainly worth a look. They will practically last forever with virtually no maintenance, even with salty air. That is something that most other materials can't compete with. For information on other low-maintenance options, you may want to look at our pages on aluminum garage doors and steel garage doors. For more information on other types of doors, go to our Related Pages menu on the right near the top of this page. Need a garage door installed or repaired? Find local reviews on the services you need at Angie's List – from garage door installation to doctors! Angie's List provides verified consumer reviews for all types of service and contract professionals, to help you find someone you can trust to install your new fiberglass garage doors.